So I read Cold Mountain back in December and it literally took me weeks to finish. I didn't hate the plot, but the writing was very difficult to get through for me. It reminded me very much of something old you have to read in high school lit class, like Faulkner or Dickens- neither of whom I'm a fan of (stream of consciousness, ugh!). Anyways, like I said, I didn't hate the story and I by no means intend to imply that Charles Frazier is not a good writer (seriously, he won a National Book Award for this book). The style of writing just is not my cup of tea. ... the movie was better. The movie took what was a confusing back and forth timeline and made sense of it. While the movie still had some back and forth between the timeline, it was kept to a minimum compared to the book. It truly helped the story make more sense. While Ruby was a smart, strong woman in the book - Renee Zellweger was able to bring her to life in a wonderful way. I loved her in the book and the movie just brought that out even more. It did seem, in the movie, that Ruby and her father had a better relationship (though still strained). He seemed super sleazy in the book, but more like a kind man gone astray in the movie. Everything just seemed to make more sense. The relationship between Ada and Inman, while still odd (but hey, what do I know about love during that time period), seemed sweeter and more emotional. Where the book was dull, the movie brought out the emotions and made sense of it all. The one major difference that I saw in the movie was Teague. In the book, I saw him as an outside collecting men who had run off from the war, and while he did that in the film too, he seemed to be connected to the town of Cold Mountain, as well. In the book, I didn't take away that he was part of the community Inman and Ada were from, so that was the one difference I really caught on to. I'll leave you with this fun fact: Charlie Hunnam plays Bosie in the film (Teague's right hand man), but by the looks of him, you'd never know it was him. 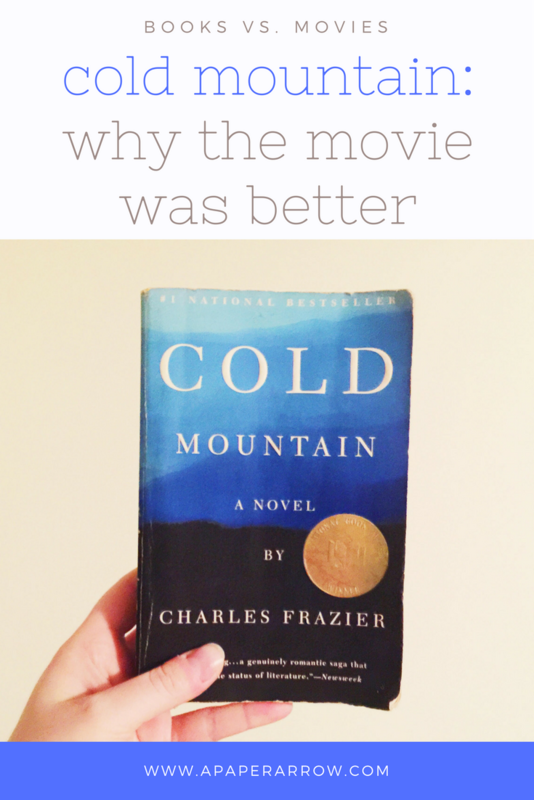 Have you seen or read Cold Mountain? What were your thoughts? This post contains affiliate links. If you click my link, and make a purchase, I will earn a small commission. I watched this movie years and years ago, and I think I was too young to really appreciate it. I do remember loving Renee Zellweger's character though. I've never read the book, but my mom has and she really liked it. Maybe I'll have to give the book and movie another try! Hi Kayla I was busy from a long time ago so didnt got chance to watch many movies. Now I get spectrum tv internet services and I am on a long vacation will all of the movies I missed and it seems amazing, thanks for the review.